Lucas Hugh activewear is designed for the woman, who does not want to compromise on performance or style, cut to complement and engineered to support, Lucas Hugh performance wear enhances form through its use of high compression, body-sculpting fabrics, supportive waistbands, and flattering ‘V’ cutouts. Based in London and produced in Europe at one of the most technologically advanced sportswear factories in the world. Black, slim-fit ‘Torque’ leggings from Lucas Hugh; a London-based women’s active-wear label that combines futuristic design with advanced technical performance. Constructed from a silhouette-enhancing, tight-weave compression fabric with moisture-wicking technology, the tights feature a firmly-supportive bonded high waistband with a vertical zip that is adjustable for a high-ride or mid-rise fit. Ankle zips and breathable panels to the crotch and backs of the knees ensure optimal ventilation during physical workouts, whilst flatlock seams provide added comfort. 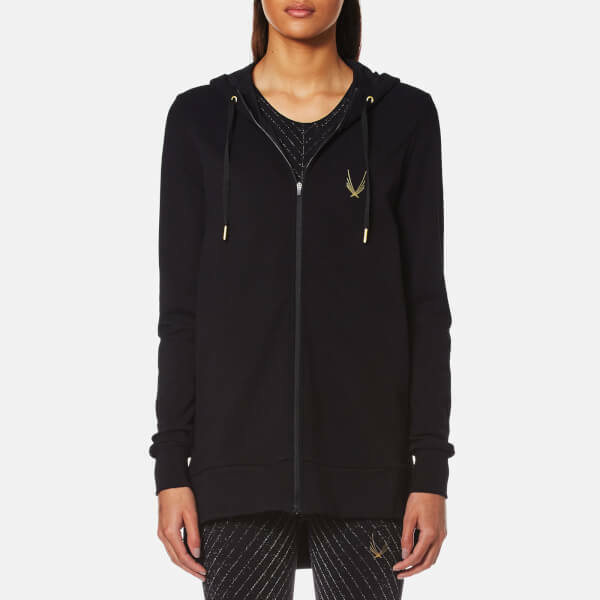 A small zip pocket to the reverse and Lucas Hugh’s signature gold logo add the finishing touches. Odyssey' full-length leggings from London-based premium activewear label, Lucas Hugh. Crafted from tight weave compression fabric with moisture-wicking properties and breathable pinhole mesh inserts strategically placed along the inner leg and behind the knee. Ideal for high-impact exercise, the slim fit, high waisted tights feature a bonded elasticated waistband, a rear zip pocket and inner briefs for enhanced comfort and maximum coverage when stretching. Technical holographic details elongate the legs to highlight the female silhouette. Signature gold-toned logo at the left thigh and back. Black, slim-fit ‘Quantum’ leggings from Lucas Hugh, a London-based women’s active-wear label that combines futuristic design with advanced technical performance. Constructed from tight weave, moisture-wicking compression fabric with bonded hems and seams, the elasticated, high-waisted leggings feature mesh inserts below the waistband and the brand’s signature opalescent transfer. Made without any zips or clasps, the leggings are ideal for floor-based exercises. Engineered for optimal support and comfort, the tights are detailed with a breathable crotch panel that allows for ventilation to keep you cool and dry during workouts. A gold foil logo on the left thigh and a concealed slip pocket to the inside reverse waist completes the design. High-waisted compression leggings from London-based activewear brand, Lucas Hugh. Forming part of the 'Limitless' collection, the 'Kubrick' 7/8 leggings take inspiration from obsidian rock formations, combining gloss and matte panels that have been strategically placed to flatter the female silhouette. Cut from high performance, compression fabric, the supportive leggings are ideal for high impact exercise, and have been constructed with breathable mesh panels to the gusset and legs for enhanced ventilation. Fusing style with function, the cropped gym tights feature bright technical taping to create a striking focal point, while internal briefs ensure maximum coverage while stretching. The quick-drying, high-rise gym leggings are complete with a zipped key pocket to the rear waistband and cut-out V-insert. Reflective gold logo to the left thigh and rear. Black hooded sweatshirt from London-based active wear label, Lucas Hugh. Crafted from a high-performance, merino wool blend and cut for a loose fit, the longline ‘Halo’ jacket comprises an adjustable hood with a tonal draw cord, a zip through fastening and long sleeves with elasticated cuffs. Featuring a drop hem with grosgrain taped side vents, the sweatshirt is complete with breathable mesh ventilation panels to the underarms, a split kangaroo pocket and the signature Lucas Hugh logo adorned to the chest. A white tank top from London-based premium activewear label, Lucas Hugh. Crafted from stretch, breathable fabric, the fitted vest showcases a round neckline, rear cut-out detail and a side split hem. Features tonal printed branding on the front and high-visibility details at the shoulder blades. Complete with the brand's signature gold-toned logo. 'Orbit' seamless technical knitted leggings from London-based premium activewear label, Lucas Hugh. Cut from circular knit fabric with a second skin fit, the high waisted tights are ideal for floor-based exercises such as yoga and pilates. Offering moisture-wicking properties to keep you dry and comfortable during workouts, the 7/8 cropped leggings feature a wide ribbed waistband, an internal key pocket and inner briefs for enhanced comfort and maximum coverage when stretching. Branded taping elongates the leg and accentuates the silhouette. Signature gold-toned logo at the left thigh. 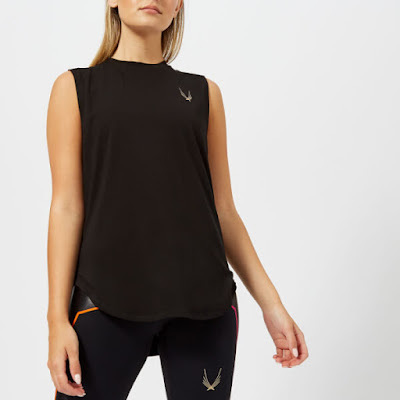 A black tank top from London-based activewear brand, Lucas Hugh. Crafted from soft-touch fabric with a lightweight feel, the 'Kubric' vest cuts a loose fit that delicately drapes over the body to flatter the form. Constructed with bonded seams, the quick-dry gym top has been designed with a high crew neck, breathable mesh panel to the back with brightly coloured, technical taping, and a curved, dipped hem for enhanced rear coverage. Complete with the brand's reflective gold logo to the left chest.